Drama, opera, ballet, circuses, concerts and puppet-shows: down the years, all these species of live entertainment faced innumerable difficulties in Ireland. Described as ‘meticulously researched’ and ‘highly original’ by the Times Literary Supplement (March 2016), this book focuses on legal aspects of the Irish theatre. Assorted venues encountered episodes of censorship and of riot. Safety of buildings, performers’ contracts, dramatic authors’ performing rights, liquor licensing all merit attention too, as, indeed, necessarily must the issue of the lawfulness of any ‘theatrical’ activity itself, given the ill-defined powers of the Irish Master of the Revels (1638–1830) and the controls exerciseable under the Dublin Stage Regulation Act (1786–1997). W.N. 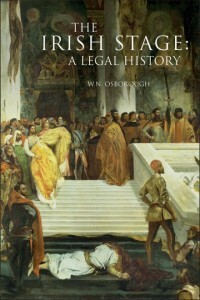 Osborough is emeritus professor of jurisprudence and legal history, University College Dublin.